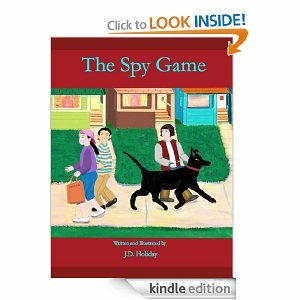 The Spy Game by J D Holiday is an illustrated story for children, ages 6 – 11 I would say. Our hero Eddie is none too pleased at the beginning of the book as he’s just had a dog dumped on him. Uncle Reese turns up with Sidney, a friendly black dog, who used to belong to a famous spy apparently. I can share Eddie’s dismay as his mum and dad expect him to do everything for the dog, taking him for walks and feeding him, and all this before they even know how Sidney is around kids! This struck me as a little over the top but I dare say kids like that kind of parental bad behaviour. Eddie can’t play with his friends as much because of Sidney but gradually he starts to appreciate him. Sidney barks loudly one night when he and Eddie hear a noise. Eddie is impressed at how brave Sidney is. Then Dana’s cat is stolen and Eddie and Sidney are called in to help. Eddie is sure that having lived with a spy, Sidney knows how to keep tabs on people and track them down. Dana thinks the local “cat people”, who remain very mysterious, took him but that isn’t the case. Her cat has actually wandered off to have kittens and it’s Sidney that finds her. Dana wants to give him a newborn kitten to say thank you but fortunately, for the tiny helpless baby cat, Eddie declines the offer! Eddie looks forward to his next adventure with Sidney. There are lots of detailed pictures in the book in a style that appeals to kids. My eleven year old enjoyed the story.